Objective Theoretical concerns regarding the supine position at rest due to the gravid uterus obstructing aorta and vena caval flow may impinge uterine blood flow (UBF) to the fetus and maternal venous return. Data sources Online databases up to 11 December 2017. Study criteria Eligible population (pregnant without contraindication to exercise), intervention (frequency, intensity, duration, volume or type of supine exercise), comparator (no exercise or exercise in left lateral rest position, upright posture or other supine exercise), outcomes (potentially adverse effects on maternal blood pressure, cardiac output, heart rate, oxygen saturation, fetal movements, UBF, fetal heart rate (FHR) patterns; adverse events such as bradycardia, low birth weight, intrauterine growth restriction, perinatal mortality and other adverse events as documented by study authors), and study design (except case studies and reviews) published in English, Spanish, French or Portuguese. Results Seven studies (n=1759) were included. ‘Very low’ to ‘low’ quality evidence from three randomised controlled trials indicated no association between supervised exercise interventions that included supine exercise and low birth weight compared with no exercise. There was ‘very low’ to ‘low’ quality evidence from four observational studies that showed no adverse events in the mother; however, there were abnormal FHR patterns (as defined by study authors) in 20 of 65 (31%) fetuses during an acute bout of supine exercise. UBF decreased (13%) when women moved from left lateral rest to acute dynamic supine exercise. Conclusion There was insufficient evidence to ascertain whether maternal exercise in the supine position is safe or should be avoided during pregnancy. In three recent observational studies, sleeping in the supine position may be associated with (1) stillbirth (OR 5.0, 95% CI 1.5 to 16.58; OR 2.54, 95% CI 1.04 to 6.189) and (2) fetal growth restriction in the last month of pregnancy (OR 5.0, 95% CI 1.2 to 20.210). The authors of these studies suggested that prolonged supine positioning poses an additional risk for vulnerable fetuses, such as those with low birth weight. Whether supine exercise is associated with these adverse outcomes has never been systematically examined. Given the potential clinical issues regarding the supine position at rest, it is plausible there could be maternal and fetal consequences to maternal exercise in the supine position. Indeed, a survey of guidelines for exercise during pregnancy from around the world showed that all but two (France and Spain) of nine countries (Australia, Canada, Denmark, France, Japan, Norway, Spain, UK and USA) cautioned against supine exercise after 16 weeks’ gestation.11 However, in all cases the recommendation for caution was primarily based on expert opinion rather than explicit scientific evidence. This systematic review was performed in accordance with the Grading of Recommendations Assessment, Development and Evaluation (GRADE) framework13 and with the Preferred Reporting Items for Systematic Reviews and Meta-Analyses (PRISMA) harms checklist.14 The protocol was registered a priori with the International Prospective Register of Systematic Reviews (PROSPERO; trial registration number: CRD42016041697). Pregnant women without contraindications to exercise according to the Society of Obstetricians and Gynaecologists of Canada16 and the American College of Obstetricians and Gynecologists17 at any stage of gestation were included in this review. The intervention/exposure was any frequency, intensity, duration, volume or type of exercise performed in the supine position (ie, flat on the back or up to 60° of inclination) alone or in combination with a non-exercise intervention (eg, diet). Exercise was defined as any bodily movement generated by the skeletal muscles that resulted in energy expenditure above the resting levels18 performed in the supine position. This definition of ‘exercise’ was chosen because the current paper is part of a series of 12 systematic reviews informing the Guideline and was used here for continuity. Acute (ie, a single exercise session) or chronic (ie, regular) prenatal exercise, measured objectively or subjectively, was eligible for inclusion. Supine exercise could have been a stand-alone intervention (including abdominal exercise, or other exercises of any kind performed in the supine position as described by the study authors) or included as one component of an exercise intervention that included exercise in other postures. Studies were not eligible for inclusion if the exercise was performed after the beginning of labour. Comparators were left lateral rest with no incline, exercise in an upright posture (>60° incline), no exercise, or other supine exercise of any frequency, intensity or duration. Following guidance from GRADE, a Guideline Consensus Panel (GCP) composed of researchers, methodological experts, a fitness professional, and representatives from the Society of Obstetricians and Gynaecologists of Canada, Canadian Society for Exercise Physiology, The College of Family Physicians of Canada, Canadian Association of Midwives, Canadian Academy of Sport and Exercise Medicine, Exercise is Medicine Canada, and a public health representative (the Middlesex-London Health Unit) identified 10 ‘critical’ outcomes as a subset specific to prenatal supine exercise and maternal/fetal health for consideration in the Guideline. Studies of any design were eligible except for case studies or reviews. Although the initial search was not limited by language, the Guideline Steering Committee (GSC: MHD, MFM, S-MR, CEG, VJP, and NB) decided to exclude studies published in languages other than English, Spanish, Portuguese or French for feasibility reasons. Potentially eligible studies were identified by a structured electronic search by a research librarian (LGS) using the Ovid interface (MEDLINE, EMBASE, PsycINFO), the EBSCO interface (CINAHL Plus with Full Text, SPORTDiscus, Child Development & Adolescent Studies, ERIC (Education Resources Information Center), Cochrane Database of Systematic Reviews, Cochrane Central Register of Controlled Trials, Scopus, Web of Science Core Collection, ClinicalTrials.gov, and the Trip Database up to 11 December 2017. The complete search strategy is shown in online supplementary 1. Titles and/or abstracts of all retrieved articles were independently screened by two reviewers. Abstracts that were deemed to have met the initial screening criteria by at least one reviewer were retrieved as full-text articles into the EndNote software (V.X5; 2011; Thomson Reuters, New York, USA). Articles were reviewed for relevant PICOS information by at least one person. If it was deemed that the article did not meet the inclusion criteria, it was reviewed by MFM prior to exclusion. If agreement could not be reached by discussion, the study characteristics were presented to the GSC who oversaw the systematic reviews and a final decision regarding exclusion was made by consensus. Data extraction tables were created in Microsoft Excel in consultation with methodological experts and the GSC. Data were extracted and verified by a content expert (MHD, MFM or S-MR), who then independently verified the extracted data. Reviewers were not blinded to study authors. If data were not available for extraction, the authors were contacted for additional information. Data that were only available in figures were extracted by two individuals independently using GetData Graph Digitizer (V.2.26). In the event that the data obtained from the two individuals differed by more than 5%, the data were then averaged to the two closest points. If this occurred, the data were also reviewed by MHD to ensure accuracy. The following characteristics were extracted where available: study design, year, country, population characteristics (sample size, compliance to supine exercise, level of activity/fitness before pregnancy, prepregnancy body mass index, maternal age, gestational age, parity, smoking status and pregnancy complications), intervention or exposure (actual and/or prescribed frequency, intensity, duration, volume or type of supine exercise; and if supine exercise was incorporated into a structured class, then the frequency, intensity, time and type for the full exercise protocol were also extracted, including the duration of the intervention and in which trimester the intervention was initiated), and outcomes. When data were reported in different units (eg, pounds vs kilograms), the data were converted to metric units. To assess the quality of evidence across studies for each study design and outcome, the GRADE framework was used.13 Evidence from randomised controlled trials (RCTs) began with a ‘high’ quality rating and was graded down if there was a concern with the risk of bias, indirectness, inconsistency, imprecision or risk of publication bias because these factors reduce the level of confidence in the observed effects.13 Evidence from all non-randomised intervention and observational studies began with a ‘low’ quality rating and, if there was no cause to downgrade, was upgraded if applicable according to the GRADE criteria (eg, large magnitude of effect, evidence of dose–response).13 One reviewer (MFM) evaluated the quality of the evidence across each health outcome using the protocol, and a second person reviewed the GRADE table as a quality control measure. All studies (RCTs, non-randomised interventions and observational) were assessed for potential sources of bias; RCTs were evaluated using the Cochrane Risk of Bias Tool for Randomized Controlled Trials, and non-randomised interventions and observational studies were evaluated using the criteria recommended by Guyatt et al.13 Risk of bias was assessed across studies and included selection bias (RCT/intervention: inadequate randomisation procedure; observational: inappropriate sampling), reporting bias (selective/incomplete outcome reporting), performance bias (RCT/intervention: when <60% of participants performed 100% of prescribed supine exercise sessions, defined as low compliance, or when compliance to the supine exercise in the intervention was not reported; observational: flawed measurement of exposure), detection bias (flawed measurement of outcome), attrition bias (incomplete follow-up, high loss to follow-up) and ‘other’ sources of bias. Inconsistency was rated as serious when there was only one study available because heterogeneity could not be assessed. Indirectness was rated as serious when interventions included both exercise and non-exercise additional components (eg, exercise and diet). In the case of one study only, imprecision was not considered serious because this was already accounted for when inconsistency was ranked as serious. Finally, if there were fewer than 10 studies, publication bias was deemed non-estimable and the quality of evidence was not rated down for this reason. If appropriate, statistical analyses using Review Manager V.5.3 (The Nordic Cochrane Centre, The Cochrane Collaboration, Copenhagen, Denmark) were planned, involving calculation of ORs for dichotomous outcomes, or mean differences between exercise and control groups for continuous outcomes, using a random-effects model and inverse-variance weighting. For outcomes or for subsets of studies where a meta-analysis was not possible, a narrative summary (one study) or synthesis (more than one study) was presented by study design, organised around each outcome. A flow diagram of the search results is shown in figure 1. A complete list of excluded studies is presented in online supplementary 2. Overall, seven studies (n=1759) from five countries (USA,19–21 Australia,22 Canada,23 Spain24 and Norway25) were included. Three studies were RCTs21 24 25 (intervention groups, n=842; control groups, n=840) and included supine exercise within a structured exercise intervention. In one RCT, the intervention included diet behaviour therapy, in addition to the exercise component.25 Four were observational cohort studies19 20 22 23 (n=77) that examined the effect of acute supine exercise alone. Of the observational studies, three included women who participated in structured exercise classes throughout pregnancy,19 20 22 and two also reported that these classes included supine exercise.20 22 All women were medically screened as low risk during pregnancy (study characteristics are listed in online supplementary table 1). In the RCTs, the exercise sessions ranged from two to four times per week, with a moderate intensity, and a duration from 35 to 60 min per session (see online supplementary table 2 for exercise description). Prenatal exercise classes included walking, stretching, swimming, and various aerobic and muscular strength exercises. Supine exercises in the structured exercise classes were performed from 2 to 5 min each session. Additional information was provided by the authors (personal communication, 18 January 2018) for duration and type of supine exercise and whether compliance to the supine exercise portion of the class was recorded.21 24 25 Supine exercises included pelvic tilts, supine bridges, Kegel exercises, yoga poses and various abdominal strengthening exercises. Stafne et al 25 reported that if participants felt uncomfortable while performing the supine exercise, they had the option to complete the exercise in an upright posture; however, they did not record the number of women who chose the option to opt out of supine exercise. Other authors reported that compliance to the supine portion of the exercise classes was not recorded.21 24 The control groups received usual prenatal care. Overall, the quality of evidence from the RCTs ranged from ‘very low’ to ‘low’ (online supplementary table 5). The most common reasons for downgrading quality of evidence were (1) serious risk of bias, (2) indirectness of the interventions and (3) imprecision. Common sources of bias included poor or unreported compliance to the supine exercises in structured exercise classes and inappropriate treatment of missing data when attrition rate was high. The quality of evidence for the observational studies ranged from ‘very low’ to ‘low’ (online supplementary tables 4–9). The reason for downgrading the quality of evidence was inconsistency (several outcomes were examined in only one study). Because there were fewer than 10 studies, publication bias was deemed non-estimable and the quality of evidence was not rated down for this reason. Meta-analyses were not performed because the data from the RCTs were heterogeneous in terms of population, intervention, comparator and outcomes. Data from the observational studies could not be included in a meta-analysis because data were reported incompletely. All results are reported narratively. Among the four maternal outcomes eligible for inclusion, data from observational studies were available to assess the relationships between acute supine exercise (pre-exercise vs postexercise) only and two outcomes (ie, maternal BP and HR). Resting BP and HR were reported only at baseline in the RCTs and not measured at the end of the interventions, and thus changes as a result of chronic supine exercise could not be evaluated. Maternal cardiac output and oxygenation were not reported in any of the included studies. There was ‘low’ quality evidence from two observational studies (n=16 women) examining the effects of acute supine exercise on maternal BP changes pre-exercise to postexercise (online supplementary table 4). One study (n=14) reported that both systolic (112±11 mm Hg, 133±13 mm Hg, p<0.05) and diastolic BP (66±6 mm Hg, 86±12 mm Hg, p<0.05) significantly increased (19% and 30%, respectively) when transitioning from the left lateral rest position to dynamic acute exercise in the supine position.20 The other study (n=2) reported no significant change in maternal BP (112±3 mm Hg, 154±1.8 mm Hg, increase systolic of 37%; diastolic 78±2.2 mm Hg, 117±1.65 mm Hg, increase of 49%) when women transitioned from 30° incline rest to acute supine exercise of double leg extensions.23 MAP significantly increased by 18% (third trimester) and 22% (second trimester)19 when women transitioned from the left lateral rest to acute abdominal exercise and 26% with dynamic exercise,20 respectively, in the supine position (table 1). None of the included studies assessed maternal cardiac output or oxygen saturation. None of the included studies assessed fetal movements. There was ‘low’ quality evidence from one RCT (n=765 women) that indicated a structured exercise intervention that included supine exercise was not associated with increased odds of SGA (<2500 g).24 The quality of evidence was downgraded from ‘high’ to ‘low’ because of high risk of bias (performance bias) and serious inconsistency (see online supplementary table 5). There was ‘very low’ quality evidence from two RCTs (n=917) that indicated no association between a structured exercise intervention that included supine exercise and SGA (<10th percentile).21 25 The quality of evidence was downgraded from ‘high’ to ‘very low’ because of high risk of bias (performance and attrition bias), indirectness and imprecision. In addition, there was ‘low’ quality evidence from one observational study that reported one incident of SGA out of 26 women who engaged in supine exercise as one component of an exercise intervention22 (table 2). Perinatal mortality was not recorded as an outcome in any of the RCTs. There was ‘very low’ quality evidence from one observational study (n=26; table 2).22 The quality of evidence was downgraded due to serious inconsistency. Out of 26 women who participated in supine exercise as one component of an exercise intervention, two delivered babies who were stillborn22 (see table 2). Of the two babies that were stillborn, the authors identified the causes as being an antepartum haemorrhage and a rare congenital leukaemia, which were unrelated to maternal exercise. Uterine artery blood flow was not measured in any of the RCTs. There was ‘very low’ quality evidence from one observational study (n=14) that measured uterine artery blood flow before and during an acute bout of supine exercise. The quality of evidence was downgraded due to serious inconsistency (online supplementary table 8). Uterine artery blood flow decreased an average of 34%±11% when women moved from the left lateral rest (410±93 cc/min) to the supine rest position (267±73 cc/min) (table 1).20 During supine exercise uterine artery blood flow (355±125 cc/min) remained 16%±23% less than the left lateral rest position. There was ‘low’ quality evidence regarding the association between an acute bout of maternal supine exercise and abnormal FHR patterns (as defined and reported by each study’s authors) in three observational studies (n=57).19 22 23 As reported in table 2, one study reported 11 (42%) out of 26 women had abnormal FHR patterns (reduced variability, n=1; non-reactive variability, n=1; reduced reactivity and variability, n=8; variable decelerations, n=1) during acute supine exercise. Of these, four abnormal patterns (reduced variability, n=1; non-reactive variability, n=1; bradycardia, n=1; variable decelerations, n=1) occurred at rest, and three out of four of these abnormalities at rest continued during supine exercise; 8 of 11 abnormal patterns that occurred during supine exercise (variable decelerations, n=1; reduced reactivity and variability, n=7) were found in those women who had normal patterns at rest.22 One study reported 5 (19%) out of 27 women had FHR patterns that were abnormal at rest (non-reactive, n=1; bradycardia, n=1; variable decelerations, n=3). Two of these women, one with a non-reactive pattern and one with fetal bradycardia at rest, were dropped and not allowed to continue the supine exercise protocol; the three other women continued to show problematic patterns (variable decelerations) during supine exercise.19 The third study reported a non-significant increase in FHR decelerations (data not given) with exercise in the supine posture compared with rest in the sitting position. In addition, out of 12 women, five episodes of fetal bradycardia were reported during (n=1) or following (n=1) single leg press exercise, and during (n=1) and following (n=2) double leg press exercise in the supine posture. There was also a single episode of fetal tachycardia in one woman (out of 12) after single leg press exercise in the supine posture23 (table 2). 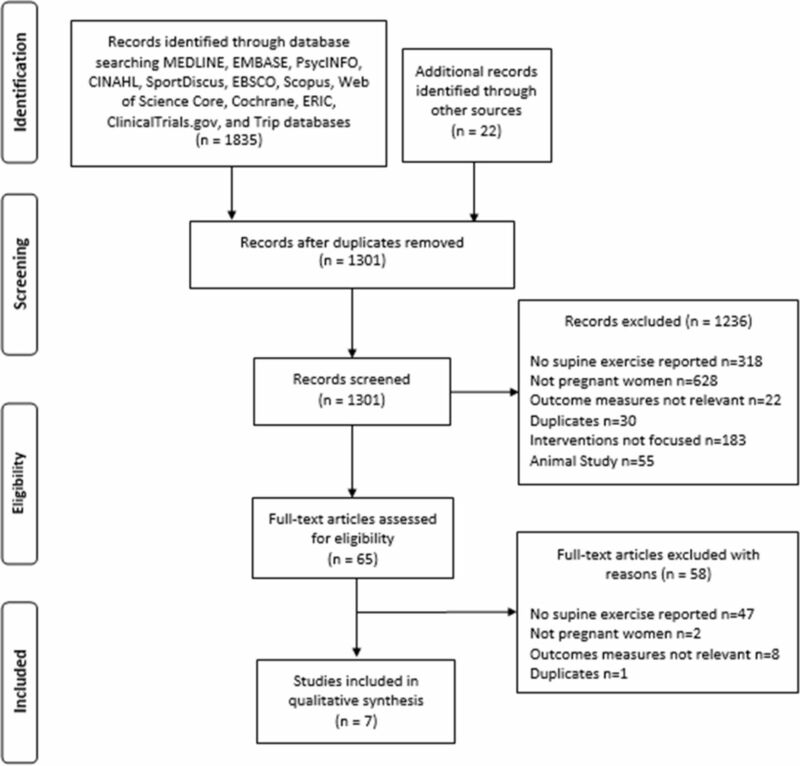 In this systematic review of whether prenatal supine exercise was associated with adverse events in the mother and the fetus, three RCTs and four observational studies met the inclusion criteria.19–25 ‘Very low’ to ‘low’ quality evidence from RCTs indicated no effect of structured exercise interventions that included supine exercise on low birth weight and SGA compared with control (ie, no exercise). ‘Low’ quality evidence from observational studies demonstrated that out of the 65 women assessed, 31% had at least one potential adverse event during one bout of supine exercise, such as reduced FHR variability and reactivity, variable FHR decelerations or fetal bradycardia. It was challenging to identify long-term fetal effects of supine exercise in the current review. Particularly, it was not possible to isolate the effect of supine exercise on low birth weight and SGA because these outcomes were examined in studies in which supine exercise was included as only one exercise intervention component in addition to several other types of exercise. Furthermore, the number of women who actually engaged in the supine exercise (compliance) component of the interventions was not recorded. Although all women were medically screened as having no contraindications to exercise before being recruited into each study, it may be that the perturbation of exercise in the supine position may unmask potential events not normally seen at rest. One bout of mainly static exercise (holding of positions) in the supine position may have acted as a stress test and exposed the cardiovascular signs of potential fetal compromise.22 On the other hand, the fetus may be able to tolerate one episode of dynamic exercise (including leg elevations) in the supine position.20 Nevertheless, observing a single bout of supine exercise in a small number of women cannot predict fetal tolerance of chronic maternal supine exercise throughout pregnancy. Furthermore, the type of acute supine exercise may be an important factor, as static exercise may elicit different responses than dynamic exercise. The limited available data suggest that the type (static or dynamic) and time allotted to each exercise bout in the supine posture may moderate the observed relationships. Uterine artery blood flow measured during dynamic exercise in the supine posture remained 16% lower than the left lateral rest position.20 The authors reported that the decrease in uterine blood flow may have been due to the 14% decrease in uterine artery luminal diameter and the 50% increase in uterine artery vascular resistance during supine exercise compared with the left lateral rest position.20 Compromised or IUGR fetuses may not be able to tolerate reduction in blood flow to the placenta due to the supine posture even though the same reduction may not cause problems in fetuses who are not growth-restricted.23 The impact of maternal supine posture at rest and during exercise on both maternal and fetal physiology remains poorly understood. Although supine rest has been associated with maternal vena caval compression leading to symptomatic hypotension in up to 10% of women,1–3 exercise in the supine posture in the present review was associated with an increased maternal HR and BP,19 20 23 and no studies examined or reported symptomatic hypotension. Normal physiological responses to maternal exercise in the upright posture are elevation in maternal HR and a linear increase in SBP (dependent on intensity) with a slight decrease or no change in DBP.26 In contrast, supine exercise in two studies increased DBP by 30%20 and 41%23 when women transitioned from left lateral rest. The implications of these maternal cardiovascular changes due to supine exercise are unknown. The strengths of the current systematic review included the rigour with which we evaluated the scientific evidence.13 A limitation of this review was the inclusion of adverse events or effects that were not named a priori by the GCP, but were listed in the included studies (eg, meconium staining). It was deemed necessary to include all identified adverse events in this review because there may be other events reported in the literature (ie, outside of the a priori list) that may be important to maternal or fetal health. However, given that outcomes identified by study authors were not prioritised a priori and were not subjected to a targeted systematic search strategy, it is possible that some studies dealing with those outcomes were missed. Despite our rigorous search process, the ability to draw conclusions was limited by the available evidence identified (primarily ‘very low’ quality). Many critical outcomes (maternal cardiac output, oxygen saturation or fetal movements) were not investigated in the RCTs. Furthermore, there was substantial practical heterogeneity among included studies, which limited our ability to pool evidence in a meaningful way. Examples included differences in population (at gestational ages examined) and duration of exercise bouts (ie, 2, 5, 10 or 35–40 min of exercise). Overall, no association between structured exercise interventions that included supine exercise and adverse pregnancy outcomes (low birth weight; SGA) was found compared with no exercise. Reported perinatal mortality (stillbirth) did not appear to be related to maternal exercise. However, potentially concerning fetal responses to acute exercise (eg, abnormal FHR patterns as defined by the study authors) were identified. There was insufficient evidence to ascertain whether maternal exercise in the supine position is safe or should be avoided during pregnancy. Further investigation is required, specifically investigating the potential impact of static versus dynamic supine exercise on acute and chronic maternal and fetal responses and subsequent pregnancy outcomes. There is evidence that during pregnancy the uterus may compress the vena cava in the supine position at rest, which may result in symptomatic hypotension in up to 10% of women (secondary to reduced preload, cardiac output and therefore blood pressure) and also compromise uterine blood flow through compression of the aorta. Exercise interventions that included supine exercise were not associated with adverse pregnancy outcomes. However, supine exercise was not sufficiently quantified and compliance to that specific type of exercise was not reported. Evidence from observational studies suggested that 31% of women who participated in an acute bout of supine exercise showed potential adverse fetal responses (bradycardia and fetal heart rate patterns as defined by the study authors). There is insufficient evidence to determine whether exercise in the supine position is safe or should be avoided during pregnancy. The authors wish to acknowledge Mary Duggan from the Canadian Society for Exercise Physiology, which is one of the primary knowledge users of the Guidelines.
. Oxygen saturation in the supine hypotensive syndrome. Obstet Gynecol 1988;71:872–7.
. Supine hypotensive syndrome. Obstet Gynecol 1994;83:774–88. American College of Obstetricians and Gynecologists. ACOG Committee Opinion No. 650: Physical Activity and Exercise During Pregnancy and the Postpartum Period. Obstet Gynecol 2015;126:135–42. Contributors Substantial contributions to the conception or design of the work, or the acquisition, analysis or interpretation of data were provided by MFM, MHD, TSN and RB. All authors drafted the work or revised it critically for important intellectual content. All authors gave final approval of the version submitted. The authors are in agreement to be accountable for all aspects of the work in ensuring that questions related to the accuracy or integrity of any part of the work are appropriately investigated and resolved. Funding This project was funded by a Canadian Institutes of Health Research Knowledge Synthesis Grant. MHD is funded by an Advancing Women’s Heart Health Initiative New Investigator Award supported by Health Canada and the Heart and Stroke Foundation of Canada. Data sharing statement Any available unpublished data are available from the corresponding and primary author via encrypted email.